With an over 10% distribution yield and long history of annual distribution increases, more investors should be talking about Buckeye Partners. Things are tight at Buckeye Partners, L.P. (NYSE:BPL) right now. The best evidence of that is the fact that this midstream oil and natural gas partnership barely brought in enough distributable cash flow to cover its distributions in 2017. However, with an over 10% yield and a long history of rewarding investors with regular distribution increases, it looks like unitholders are being well rewarded for the extra risks they are taking on. Here's why you should start talking about this high-yielding partnership. Buckeye owns a collection of pipelines and storage facilities. Notably, its energy storage business reaches well beyond domestic shores, providing a material amount of diversification to its operations. Most U.S. midstream companies are focused only on North America. This is a relatively new push for Buckeye, which has grown its global terminals business from nothing to around 45% of adjusted EBITDA since 2010. 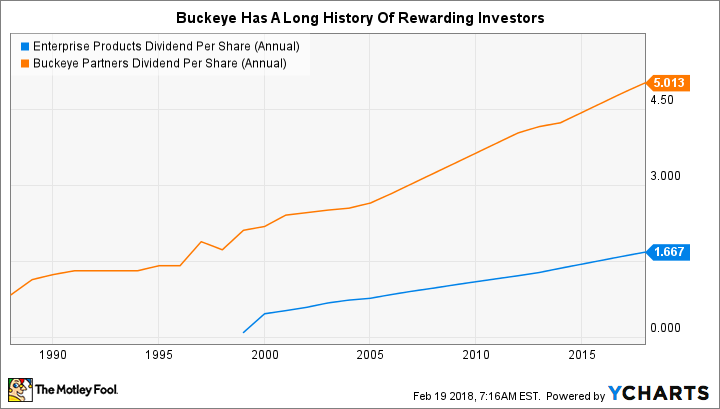 The $8 billion in spending on acquisitions and capital projects that required, however, didn't stop Buckeye from rewarding investors well along the way. The partnership has amassed an incredible 22-year streak of consecutive annual distribution increases. For comparison, industry bellwether Enterprise Products Partners L.P. (NYSE:EPD) has a 21-year streak. At a $7 billion market cap, Buckeye is tiny compared to Enterprise ($56 billion market cap), but it can stand eye to eye with the giant when it comes to distribution streaks. The problem is coverage. Buckeye's coverage ratio of just 1 in 2017 was well below Enterprise's 1.2 times. That helps explain why Buckeye yields over 10% and Enterprise yields around 6.4%. In fact, Buckeye's coverage actually dipped below 1 in the third quarter last year, meaning it didn't cover its distribution over that three-month span. EPD Dividend Per Share (Annual) data by YCharts. To make matters worse, Buckeye had been regularly upping its distribution every quarter for a while, but it hasn't provided an increase in three quarters now. That's not exactly a compelling signal of strength. Add to this the fact that the midstream partnership is embarking on a round of capital spending, following a big acquisition in 2017, and you can see where investors would be worried about its ability to support the distribution. The thing is, you don't get to 22 years of annual distribution increases without a commitment to rewarding investors. Case in point: This isn't the first time distribution cover has gotten tight for Buckeye. It actually fell below 1 on that key metric in 2013 and 2014 while management waited for the cash flow from new investments to catch up with its distribution. Distribution coverage was comfortably back over 1 in 2015 and 2016. The third-quarter 2017 coverage shortfall was partly the result of timing, with new shares issued to complete the billion-dollar acquisition of a 50% stake in VTTI, a global energy storage company. In total, Buckeye's unit count increased by roughly 6.5% in 2017. As the assets acquired start to throw off cash, coverage should improve, evidenced by the 1.01 times coverage achieved in the fourth quarter. That said, the partnership's growth plans aren't over yet, so expect coverage to remain touch and go for a little bit. Just don't make a mountain out of a molehill. We've already seen the long-term commitment to the distribution at Buckeye, but that's not the only positive to fall back on, here. 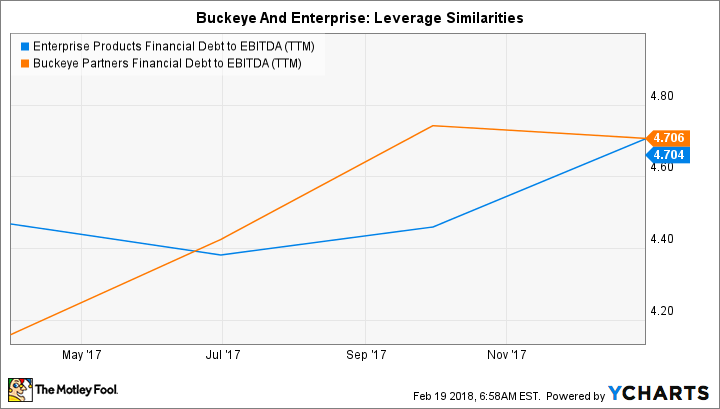 For example, Buckeye's debt to EBITDA is basically in line with Enterprise's numbers. This suggests that leverage isn't too big of a deal, either. EPD Financial Debt to EBITDA (TTM) data by YCharts. And while Buckeye has halted quarterly distribution increases, the move follows Enterprise's comments that partnerships are no longer being rewarded with higher unit prices when they increase quarterly -- one reason why Enterprise has chosen to materially slow its distribution growth rate. In other words, why bother with quarterly hikes if investors don't care. Buckeye could hold the distribution steady all year in 2018 and still reward investors with a 23rd consecutive annual increase since the last increase was in August of 2017. You clearly need to monitor Buckeye's distribution coverage. It can only go so low before there are problems, of course. If you are truly risk-averse, Enterprise is a probably a better option for you. But if you can stomach a little near-term uncertainty, don't focus all of your attention on the coverage metric, because there's more to understand, here. Right now, you should be monitoring management's spending plans to see how those investments are playing out. As long as progress is being made and distribution coverage doesn't fall off a cliff, it's highly likely that this partnership's distribution will hold -- just like it has during previous periods of growth. Is Buckeye Partners a Buy?